I’ve been playing around with the idea of building a rig to suspend an object, like a camera or prop, using three wires and then control its position in 3-D space using a few stepper motors and a micro-controller. The general idea is similar to the skycam system they use at football games and other pro sports, or a large scale delta robot. The first thing I needed to figure out was how much I wanted this rig to be able to hold and how much tension (force) would be required to hold and move this weight around. Additional I wanted to be able to visualize the results so I could look for any peaks, valleys or other anomalies that would throw off my calculations. 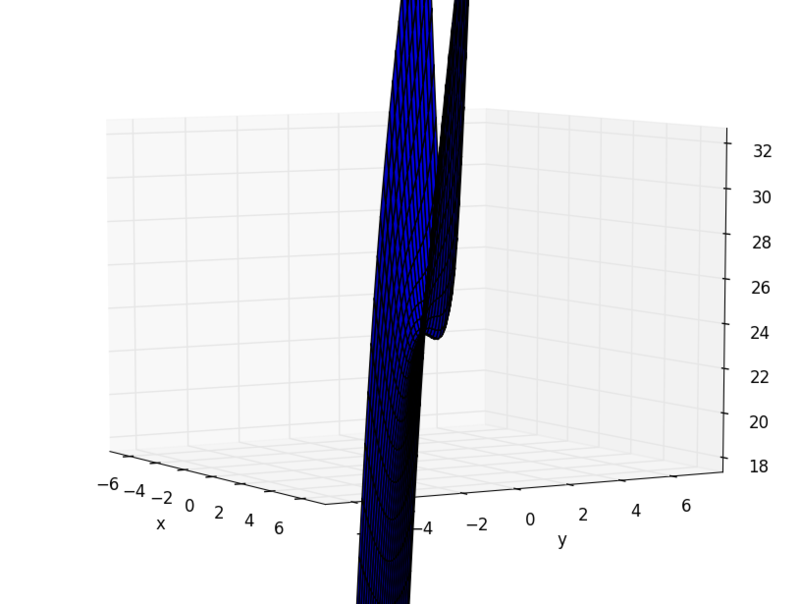 I ended up writing the python script below utilizing the mpmath, sympy and matplotlib libraries to calculate the tension on a wire due to a suspend mass at a specific height and plot it as the weight moves around the x/y plane. The image below is a sample of the output from this script for a 5 kg mass suspend 2.0 m above the ground with three anchor points at 3.0 m above ground level and each 120 degrees apart. The first test of my robot platform using wheel encoders and a rough PID loop to perform a box routine. The overshoot and quick turn around are because I did not round off the corners of the box pattern so as the robot finishes one segment it realizes that is has gone to far and quickly turns to get back on course. I’ve been working on a c library to simplify access to the gpio on the BeagleBone board for use with the robot I am working on. My initial pass at this worked decently but was not as flexible as I had hoped. Over the past week or so I’ve been re-writing the majority of the code as a base class and set of derived classes to handle the various pin functions. So far I have objects to handle accessing analog pins, basic digital gpio I/O, and serial ports. The results of my work can be found at: http://code.google.com/p/beagleio/source/browse/branches. FIFOs (First In, First Out) are essentially memory buffers used to temporarily store data until another process is ready to read it. As their name suggests the first byte written into a FIFO will be the first one to appear on the output. Typically FIFOs are used when you have two processes that operate and a different rate. A common example is a high speed communications channel that writes a burst of data into a FIFO and then a slower communications channel that read the data as need to send it at a slower rate. This weekend I have spent some time and updated the site, the most obvious will be the new theme. The banner photo is a shot of my home workbench which is currently occupied by one of my robots. I have also gone through and cleaned up the tags and categories along with adding a list of categories to the side bar. This little bit of code will count the number of 1’s or 0’s, depending on how it is configured, in the input signal. This module is not the most efficient way to program one of these, when it comes to synthesizing, but when dealing with variable length I/O it is the easiest. The INPUT_WIDTH variable determines how wide the input signal is and the COUNT_WIDTH does the same for the count signal. The COUNT_TYPE determines if you are counting the number of 1’s or 0’s. Every time the write enable (WrEn) is high on the rising edge of a clock pulse the module will count the number of 1’s of 0’s on the input signal and write the result to the count signal.